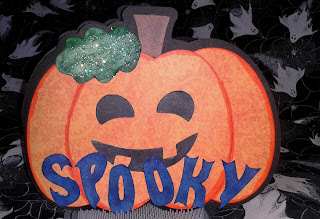 I accomplished one more Halloween card today and found one I forgot that I made a few weeks back. 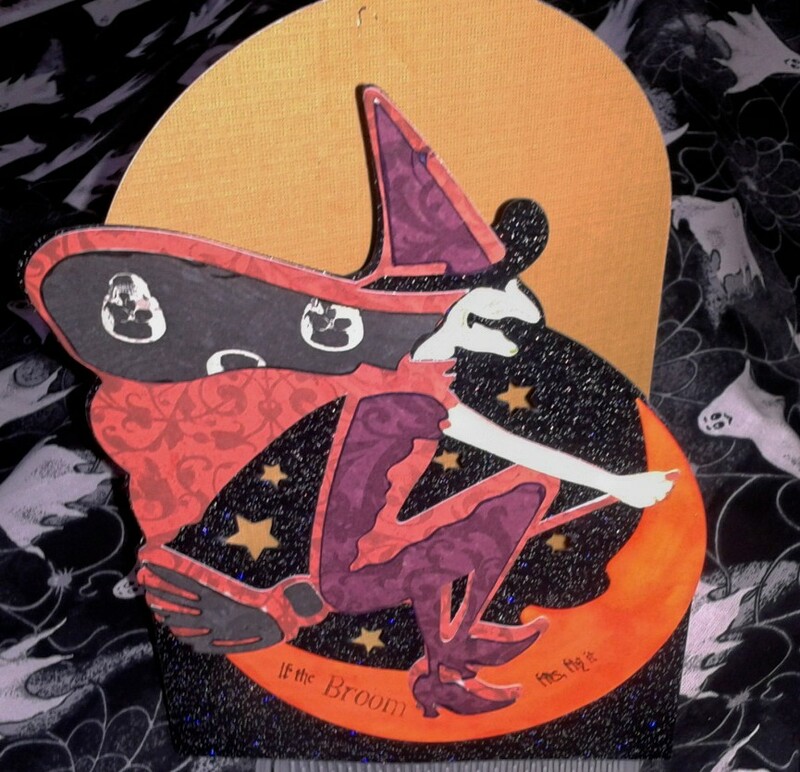 This card is available in the Midnight Jamboree SVGCuts set. The sentiment on the moon is from the Fright Night Phrases stamp set from MyThoughtsExactly.com (another favorite place of mine!). I used a glittered black paper that I have been hoarding for almost two years for the sky sectoin and the brim of the witch's hat. Here's a trick, to not dull your blade so fast, turn glittered paper over on your mat so the glitter is face down and flip your file so that when you take it off the mat and turn the paper over it is facing the correct way. Also, instead of trying to put enough force to cut through the glitter paper once just repeat the cut at your normal force - again saves on your blade. The second card I finished today is the Spooky Pumpkin. 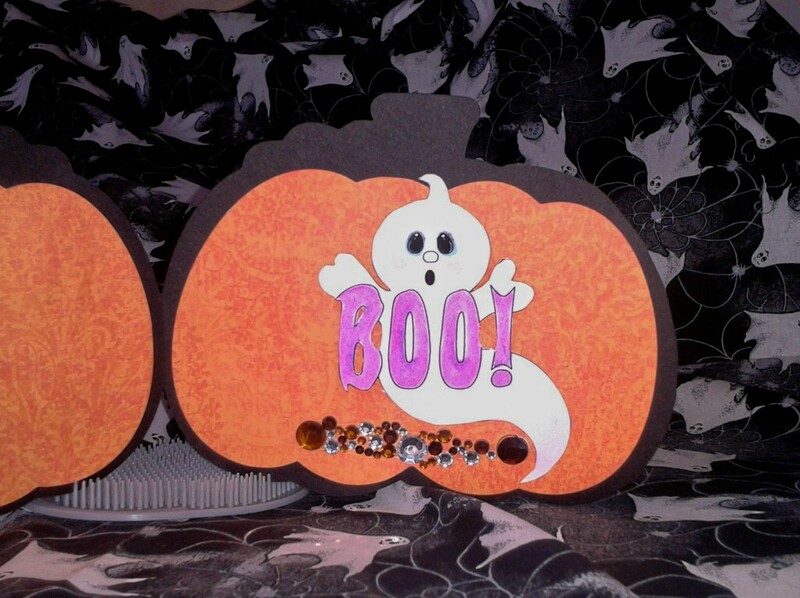 The Spooky Pumpkin Title file is available from Melissa over at Kadoodle Bug Designs. I made a shadow layer of the pumpkin and then duplicated that shadow layer, flipped the second one and welded the two together to make the card base. The file is original artwork of Kristi W. Designs. For the inside I again made a shadow layer of the pumpkin (not the stem and leave this time) and cut two (one flipped). The adorable little ghost is a digi stamp again from the fabulous Kadoodle Bug Designs - you can also purchase the Spooky Pumpkin as a digi stamp or the little ghost as a cutting file. The ghost is also original artwork of Kristi W. Designs. Well I hope you enjoyed the two new cards. Thanks for stopping by.